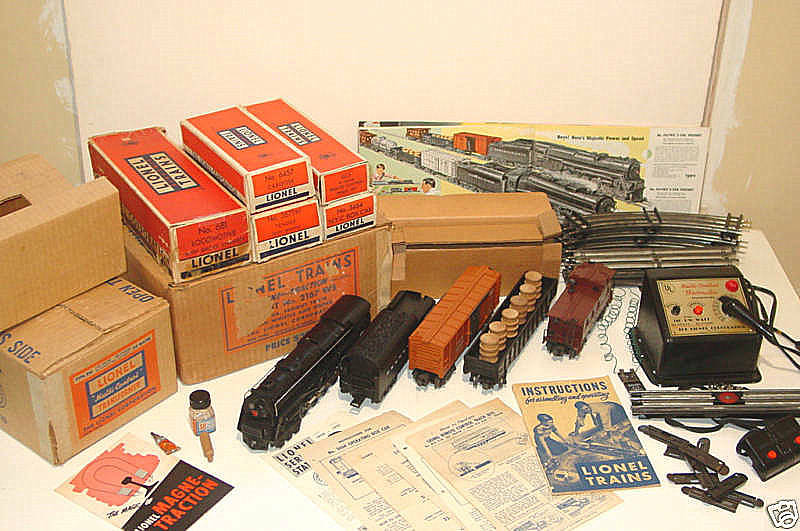 How much did you run your childhood trains? Looks like the wheels on the 2343 Santa Fe that my grandfather had on his 16x24 layout. He operated it so much had to replace motors as well. Great reminder of running trains with gramps! Ran mine quite a bit. Not to this extent though. I ran so much, at least 1 to 2hrs EVERY DAY, i destroyed the truck sideframes on a bunch of Lionel Standard O freight cars. The axles ate thru the sprung truck cast metal sideframes. Train was allowed out of the box starting Xmas Eve for a period of 14 days. That was it. Now that faithful #627 44 ton along with is gondola with 4 canisters and flatcar with deteriorating plastic pipes and a caboose see action once a month just for fun. It has survived 63 years with some scratches and dings but nothing like what the OP shows. Ran my AF S gauge trains for several weeks before and after the Christmas holidays, maybe a couple of hours a day. I did not sustain any wear like that shown above ever! My Christmas gift Marx #25000 set's #999 was run and run and run. Drivers were grooved like above and one was loose and spinning on the axle when the car nut phase began...but, sadly, the boxed set was on the basement floor when the water heater failed. MY trains where set up at the most one month a year at Christmas season. The rolling stock wheels where so worn out they would not stay in gauge anymore. Wow! Mine didn't see anywhere near that much use! My childhood 2055 small Hudson. Got it, and my set, and my layout (never had a train around the Xmas tree) new in 1955. I well-used it but never abused it. Note the rollers and the homemade rear truck retaining c-clip, a brass washer that my father massaged in the 50's to replace the factory piece that got lost. Still there. The 2055 and clones were classy and had the best tooling of all the PW Lionel steamers; crisp and clean, and the shell was thinner and in one piece from pilot to cab, very different from and seemingly more sophisticated than most of the Lionel steamers of the time. I wonder if it had a different source? My favorite PW non-scale steamer (kinda had to be). It is even not a bad compressed near-model of the ATSF 3460-class 4-6-4's, except for the NYC scale Hudson-derived smokebox front . I was only allowed to set my trains up and run them from November 28th until Feb1st. Otherwise the trains remained packed away, or on my Dad's office shelves. But when I could, I ran them for hours a day. My Korean-War-era 2026 only came out at Christmas time, for a period of two or three weeks. But during those times, I ran the bejayzuz out of it. And my youngster self knew naught of cleaning or lubricating its mechanism. Nevertheless, today it shows no signs of wear or overuse, as the OP's locomotive does. My brother and ran our train board, an oval and figure 8, 5'x 9' with Christmas tree in a mountain on the train board, from Christmas eve to the Jan 2. Usually an hour or so a day at most and the train was a Marx 999 train set with extra coal car. Christmas toys got usually got more use during that time but we looked forward to it being put up with maybe an addition of building or small accessory on the next Christmas eve. When we were 10 and 8 or so, we talked our Dad into putting the layout up in the new houses bigger basement full time. We did not use it much and after a several months of in action, Dad took it down, removed the track and switches and threw the board out. We had gotten into building toys with a peddle driven jigsaw and building solid, then stick model airplanes and boats. Later s Wasp 027 engine came and still later Fox 35 model planes and flying them up through high school. Also model boats and RC boats. The train bug died for us until I had children some twenty years later. Around 1976 while working in Jamaica, I stated my toy train 027 operating, 27 switch layout with the $10 homemade turntable. The layout I still have after being moved to 5 houses in 5 states and expanded by 50%. My brother never got into trains again and was big ham radio operator. I still have all my childhood trains from my parents. I will always keep them. As a kid had a sheet of plywood in my bedroom were i had to keep them.As a teenager took over shed in backyard and remodeled it for my trains. Near daily during train season, less during spring and summer months. Ran my trains for hours and hours in our farmhouse. Burned out the Gantry Crane. Started on the rug and then eventually had a couple of 4x8s. As the family grew I ended up running them in our abandoned chicken coop. I must have been more desperate than I thought. Must have packed them up about the time my friends and I started thinking about cars and girls. Sixty three years later I still enjoy running those post war trains for hours and hours again along with the modern stuff. Better yet, still do it with the same two train buddies from the third grade. Dad got me (him) a 681 set for Christmas 1950. I was one. Ran it so much as the years went by that I wore out the rear axle bushings. Then over lubed and a rear driver came loose on the axle. We sent it off to Lionel for repair in the late 60's. Lionel responded that they couldn't (wouldn't) fix it but if we sent them $20 they'd replace it with a new 736 Berk. WOW! All those side/drive rod/linkages compared to the single Turbine rod. Dad came up with the $20. Still have the 736. I've repaired many a Turbine/Berk with loose rear drivers since. Maybe can see why Lionel balked in their decline during their decline. My train set was a Christmas layout every year until New Years then it was packed away, When I was finally old enough to run the trains myself, I was allowed to keep the layout up in the basement until after my birthday in January. I always spent birthday money on trains. Usually in Feb I was required to pack the trains away until next year. I always enjoyed building different track layouts, even used trestle set. At my former place of employment, I had an MTH bump and go trolley running around the company Xmas tree. 10 hours a day, six days a week between Thanksgiving and Xmas. I once estimated it was traveling approximately 13 actual miles per shift. The motor wound up grenading after 3-4 years of this. With a new motor and pickup assembly, the little trolley is still going! My only 3-rail train was a hand-me-down Marx steam engine NYC litho set. Had so much fun with that little Marx set. I don't know how often, or how long it would be set up and ran, but it survived my years until I "graduated" to HO scale on Christmas Eve, 1962. My little Marx set was handed-off to my younger cousin and he continued to play with it. In retrospect, I sure wish I'd kept it. Like several earlier posters; my Lionel set came out when the Christmas tree went up and went away when the tree came down. Mom and Dad did finally consent to my keeping the platform accessible in a corner of the basement so I could run my train all year if I wished. The reality was I rarely touched it outside of the holiday season. My friends and I spent most of our time outdoors, whether through the cold and snow of winter or the heat of summer. Winters meant snowball fights, sledding and building igloos. Summers meant cowboys and indians, ball games, bike riding and cave exploration among other things. I still have my original Lionel train and it sees annual use around one or both of our Christmas trees. And; it’s still “original” meaning no wheel or pickup roller replacement. Yes, I am pretty much with you.Our Xmas train was a 318 Standard gauge passenger set that, I might, be allowed to run for a day before the tree came down. Then it died. I got my Scout set when they first came out at Xmas around 1947. I had an 027 layout on wood with small wheels so it could roll under my parent's bed in our 4 room apt. All 5 of us and the dog. So I am in to trains in spite of my family. My wife liked them, that helped. My Christmas train was a Lionel 736 Berkshire freight set that got much running during the holidays and after. When my son came along and I passed it on to him, it got quite a workout on our current layout, the Great Northeastern Railway. Below is a link to a YouTube video of that same Berkshire pulling a 22 car train of refrigerator cars and box cars at night. My son Chris is at the throttle. https://www.youtube.com/watch?v=tBgaFmSSSbc.